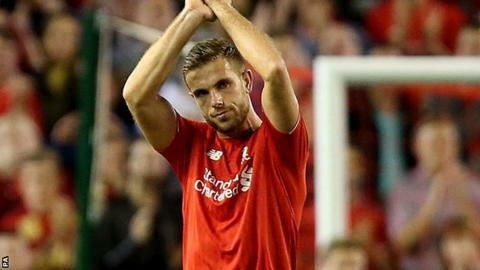 Liverpool midfielder Jordan Henderson has broken a bone in his right foot and will be out for up to eight weeks. The 25-year-old England international suffered the injury in training and is likely to have an operation on Monday. Henderson could miss up to 11 matches for Brendan Rodgers' side. He will also be ruled out of England's Euro 2016 qualifiers against Estonia on 9 October and Lithuania on 12 October, and will be a doubt for friendlies against Spain and France in November. The injury is not related to the heel problem on his left foot, which has restricted the former Sunderland player to just two appearances this term. "Very disappointed and frustrated with the injury setback but will work hard to be back as quickly as possible," tweeted Henderson, who scored six Premier League goals last season. "Will be supporting the team in every way I can while I'm unable to play. Thanks for all of your support." Henderson, whose side host Norwich City on Sunday, could be sidelined until mid-November, meaning he will sit out the Merseyside derby at Everton on 4 October and the trips to Tottenham and Chelsea later in the same month.